Table linens can be complicated. Learn more about the fabrics, colors, and various options you’ll have and find out how you can ensure you create the atmosphere you’re looking for your event. 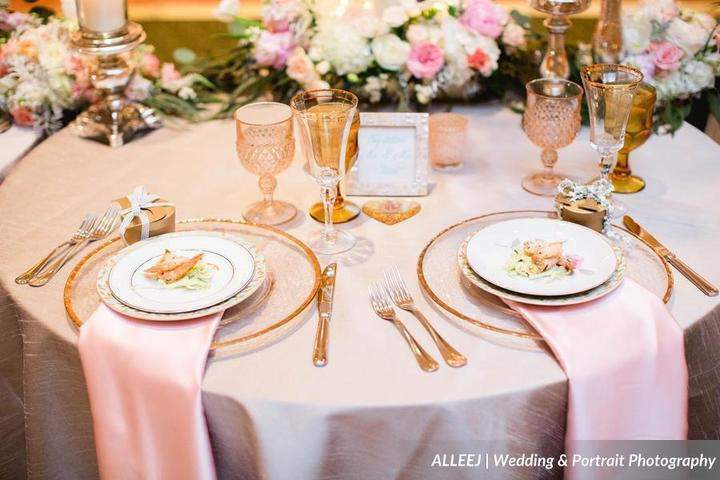 While you may be more focused on flowers, venue, or food, table linens are not as simple as you may think. From different fabrics to table sizes, it’s important to get them arranged in time. Using linens to bring your vision to life isn’t as easy as simply putting them on the tables with the centerpieces on top. You probably haven’t been thinking about them much outside of maybe color, but that’s okay! We’re here to help you select the perfect linens to create an immersive experience for your guests. Bengaline is a stretchy, ribbed fabric. With a unique and shimmery look, it can add dimension to any table. Known for its durability and versatility, bengaline linens are perfect for almost any event. With a crinkle taffeta, you can evoke a playful look. This material catches the light and shimmers, adding a mystery and metallic quality to your event that will look especially striking in low light. Crush fabric is lightweight and elegant, bringing a decidedly sophisticated look to your tables. This fabric is particularly useful for those having winter and fall weddings, as it allows them to create an air of heaviness that’s harder to achieve with more satin and sheer fabric options. Pintucks offer a square look that can elevate in darker shades. It can also offer a more casual look when done in pastels or neutrals for spring and summer weddings. It’s geometric shape also offers more interest and texture than that of the other fabrics. Polyester may not be perfect for clothing, but a polyester tablecloth hangs well on any size of table. With a variety of colors and styles, the versatile fabric is inexpensive and easy to work with for your seating and buffet tables. Satin is chic and offers a shiny look without it being too glitzy. Lamour, while shiny, offers a softer matte texture.You can utilize satin or lamour in almost any color, making it versatile and ideal for tables. A silk tablecloth can be the right choice for many a table. Shantung tablecloths offer a degree of elegance, without being fussy or heavy to deal with. 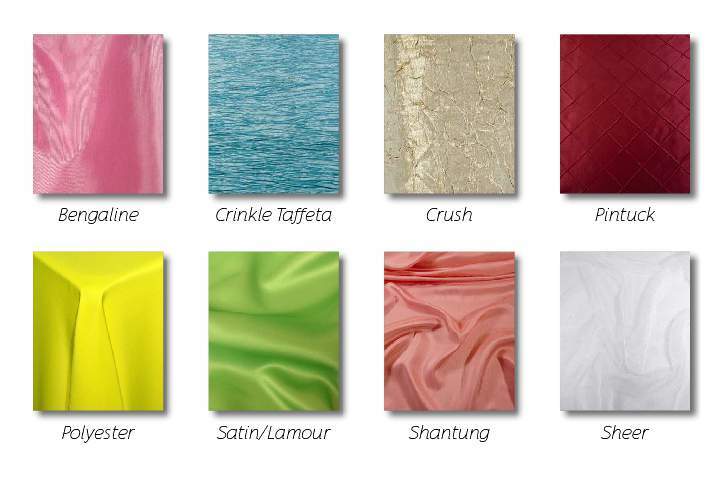 In any color, Shantung silk linens are a great choice and compliment a variety of uses. For summer weddings and those that want to have a dreamlike atmosphere, sheer fabrics are a great way to go. You can highlight the tables you’re using or simply give a degree of breeziness for your event. This light, easy to work with fabric looks great with almost any color. When it comes to creating the look you want, different sizes and shapes make a big difference in your linen choices. Make sure you speak with your linen rental company to ensure you get the right size for the look you’re going for. After all, some want their linens to reach the floor while others are looking for a simple covering for the table in the style of a topper or runner. By looking into the different ways individuals use their linens, you can personalize your look and make sure you achieve the right vibe for your special event. Napkins? Coordinating florals? Overlays? All of these pieces go with your linens to achieve a complete look. Make sure you speak to your event rental company to see what else you can get that will coordinate with the linens you’ve chosen. They may even have furniture, glassware or china in complementary colors. Check out Marquee’s linen selection. We have a variety of colors, finishes, and fabrics that can help you create the look you want for your big event or wedding.